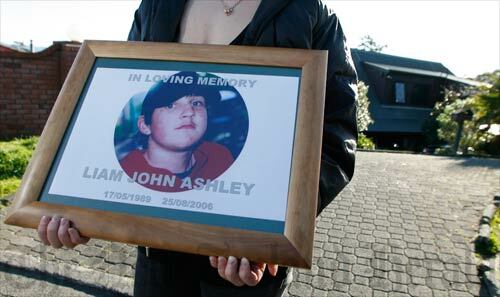 A family member holds a portrait of 17-year-old Liam Ashley, who was murdered in 2006. Ashley, a prisoner on remand, was assaulted by another prisoner in the back of a security van when they were being transported from Auckland's Mt Eden prison to court. He later died of his injuries. The case stirred public controversy about the conditions under which prisoners were transported.